Hi all, in this article I will describe how to integrate ExtentReports reporting tool with TestNG Listeners. I described how to use TestNG Listeners in this article and Canberk Akduygu and I also described how to rerun failed tests with IRetryAnalyzer in this article. Here, I will use TestNG listeners and IRetryAnalyzer interface and add ExtentReports classes to generate very beautiful reports after each test run. If you do not know Page Object Model, before starting this article, I suggest you check my POM with JAVA article. In our Page Object Model example, we create two login tests for n11.com website. Now, I will add ExtentReports and Listener packages under test package as shown below. I created ExtentReports package under utils package and add below two classes in that package. In this class, we created an ExtentReports object and it can be reachable via getReporter() method. Also, you need to set your ExtentReports report HTML file location. //OB: ExtentReports extent instance created here. That instance can be reachable by getReporter() method. An extentTestMap map is created. It holds the information of thread ids and ExtentTest instances. ExtentReports instance is created by calling getReporter() method from ExtentManager. At startTest() method, an instance of ExtentTest created and put into extentTestMap with current thread id. At endTest() method, test ends and ExtentTest instance got from extentTestMap via current thread id. At getTest() method, return ExtentTest instance in extentTestMap by using current thread id. For retry failed tests, we should add AnnotationTransformer, Retry classes. In order to listen to test events such as passed, failed, skipped, etc. we should add TestListener class in our project. I added ExtentReports codes in each method and add some informative comments. //Do tier down operations for extentreports reporting! //Extentreports log operation for passed tests. //Get driver from BaseTest and assign to local webdriver variable. //Extentreports log and screenshot operations for failed tests. //Extentreports log operation for skipped tests. You can add test descriptions in your tests and you will see them in the report as shown below. We should add listeners in TestNG.xml as shown below. //Create a Chrome driver. All test classes use this. //Create a wait. All test classes use this. // 3) super () method in page class transfer the driver and wait variables values to the BasePage class. After test finished, you will see ExtentReportsResults.html file under ExtentReports folder as shown below. When you open the report, you will see the test results as shown below. Also, you can check How to do Test Reporting with Allure and TestNG. Also, you can check How to do Test Reporting with Extent Reports Version 3. Also, you can check How to do Historical Test Reporting with Klov – ExtentReports. See you in next article! Onur Baskirt is a senior IT professional with 10+ years of experience. Now, he is working as a Senior Technical Consultant at Emirates Airlines in Dubai. This is really a good article. I follow all your selenium and automation testing articles and of course helped me in creating a framework at work. Could you please create a similar article using Allure reporting. It really helps me. Thank you, Sudheer. I am planning to write an article on Allure Reporting Framework. Also, you can check ReportPortal.io it is also an amazing reporting tool. First, i’m sorry for my english. Second, i tell you that it is the best report for testng that i know, and i congratulate you for it. congratulations. but, i have a problem. i can´t watch the feature name and the step name. how can i watch it? Are you using Cucumber? I have not enough experience how to get feature and step name. But you may use the description as I told in the article. yes, i am using cucumber. i use the description for other something, but i need put the step name when say “STEPNAME”. thanks! How to invoke ExtentTestManager.getTest() method in test classes and page classes? I am getting “Null Pointer Exception” while calling getTest() method. Can you please help me out with this? Same.. You lost me here. Im getting the same error. I found my own answer… I was using version 3.. This docs say version 2. Yes Can. I implemented for Version 2. You are right. Great article! Is it possible to add test steps in ExtentReport? (Like Allure?) and console logs? I am adding logs by using below line. For console logs you can use JAVA’s System.out.println(); method. I am not seeing the definition for the BaseTest.java. What is the definition you are having there. I want to add my class name as a heading in the report. Like if Class A has five Test Cases and Class B has 4 test cases then Class name i-e ” Class A ” should appear as a heading on the left side of the report and then the test cases. Do you have any idea how to generate one report for multiple test suites run. For example we run 2 suite files with maven surefire plugin. So is there any way to create extent report that would include all suites in one report? I mean report should look like suite1 name->all tests in suite, suite2 name-> all tests in suite. The best article for extent reports. I will definitely save this page for future reference. I read several and eventually figure everything out, but this article is so detail and easy to follow. This would of saved several painful headaches. You are welcome! I am happy that the article helped you. I really appreciate your positive feedback. Thanks for the info, it really help me. I want show falied and pass test cases log on report. Can you please tell me where we to change this. If possible tell me class name and code. You mean Allure report? TestNG Report is a different thing. Thanks for great article and response. I am using latest extent build 3.1. Could yo please give the same berief for latest build. Thanks Onur, for the detailed tutorial implementing Extent Reports. I have a issue where the failed test is showing unknown tag in report. Welcome Sam. I think you need to debug it failure condition in your environment. I can not say an exact solution without debugging your project. I suggest you put some breakpoints on especially aftermethod() and failure condition in the listener class and see what happens. Hi Onur, Do I have to change something for screenshot method as I using the extent reports from Android Appium automation framework. Yes, you can change and check the results. If your change works well. Keep the modified version. I wrote these part for web automation. For mobile, please try your implementation and keep us updated. Thank you. I am using the same code for 1 year and did not get any null pointer exception. It is better to debug your project Sam. I am sharing the Failure code of the listener as follows. Then, run the project and I didn’t see any problems. Very good article, Thanks!!!!!!!!!! I have an issue of Screenshot when I run through Jenkins server. Screenshots are crashing only when I run through Jenkins. working fine in my local. Can you help me out? Hi, it may be about Jenkins server’s operating system. Are your local machine and Jenkins both Windows? And maybe folder permission problem. It is really hard to detect it with these inputs. I wanted to show the validation error in the failed report. Can you please let me know how we can code it? can you please help out in the case of Failed scenario, basically i dont need to retry the step/scenario in case of fail. I am able to generate Extent Reports by passing parameters from testng.xml for single devices. I am able to generate Extent Report. But, I would like to make some changes in Emailable-Report.html and generate Emailable-report.html in the form of Extent Report. Is there a way to do it? By the way, I am using Jenkins as well as the CICD tool. I would like to change the Test_Name with some respective test case number or description in the reports. Is there a way to do so? I really did not figure out the problem. If you are getting null pointer, you are using an object without any assignment. In debug mode, you can try to comment out extentreport parts? I really can not provide a super solution. Wonderfull Article , need you help in customizing the ‘Report’ ? When the Report get generated , I want to change few heading – for example on the top of the report there is a heading “Automation Report” , HOw can I change this to something else ?? I tried finding the code for it but din’t find it.. I don’t know your whole project structure but I can assure that it is caused by the empty object. You are using unassigned/empty/null object and getting null pointer exception. I highly suggest you put some breakpoints and debug your project. Then, I believe that you will figure out the null object. When I looked at your code, I do think that the problem maybe is about you can use getTest() before startTest Method call. If a test case fails in first execution, retryAnalyzer would again execute it. if first time execution fails and second time execution passes, I want to show the results of only second execution in Extent Reports. But I am getting both the test case results in the report how to overcome this problem could you please guide me and more thing we cannot get report if we execute main class instead of testng.xml . I am not %100 sure but when the test fails, the listener class reports the failure scenario and Retry class reruns the test. Maybe you can add a fail counter into your TestListener class and when the fail counter will be increment by one then you can print the result on the report. This is one of the solutions that you can apply and it is very easy to implement. Please try this and let me know. Just add an int failcounter = 0; and in onTestFailure method first check failcounter == 1, if not increment it by 1. In this way, you can only show the second result of the failed test in your report. Also you can play this number based on your retry count. Thanks. Hi Onur ,Thanks for response i will implement and let you know d status it’s very grateful these type of articles are very useful who are facing challenges in automation. Thank you for the detailed explaination! It is super helpful. However your exact same code with your tests above is throwing a null pointer exception. I am using v2 of extent reports. The only difference is I am not tunning t from an xml file, which shouldn’t matter. What’s the solution to this? Hi Onur, I am getting a null pointer exception too on getTest(). I’ve used your project without any change and have added a basic test. Please suggest a solution. I will check and get back to you. Hi, please comment out this line in base test class. Amazing, got the things done in a single shot!!! It’s really really helpful. Do you your video channel also because it would be very easy to understand . Thank you Muni. Honestly, right now I am focusing the blog but if I will have more time, I may record some videos. Thank you again. Wonderful article!, I only have one question, how did you get SO good at coding? 🙂 I have been following your articles for some time now, and there’s a plethora of knowledge here and I like your coding style, is there anything that you can suggest so that people like me who are learning to be better at coding can well, be better at coding? Thank you Rohit. I am so happy that you like our articles. I suggest you follow some good tutorials on pluralsight or udemy for advance JAVA knowledge. I am still learning and improving myself. Also, I suggest JAVA for Testers – Alan Richardson book first. After this, you can move on with more advanced tutorials. I would definitely go through all these. A BIG Thanks to you and once again, Keep up the good work!! This is just beautiful. Thank you so much for the efforts. Very detailed and easy to implement steps given. Can you pleaseeeee help, this is the last step remaining. Any pointer to resolve the problem will be really a big help. Aniket this is a very specific problem. Maybe below references will help you. https://www.baeldung.com/java-measure-elapsed-time this will be helpful. you can add start and end times in the listener methods. Before test starts and after test ends use JAVA timing methods to capture the elapsed time of the tests. Hi onur, Thanks for such wonderful explanation. Can you provide some solution to display the test ended time and time taken to finish fields? Currently they as displayed null for starting testcaces where as it’s displayed fine for last test case. Hi, I think we can do that with JAVA timing APIs. long duration = (endTime – startTime); //divide by 1000000 to get milliseconds. 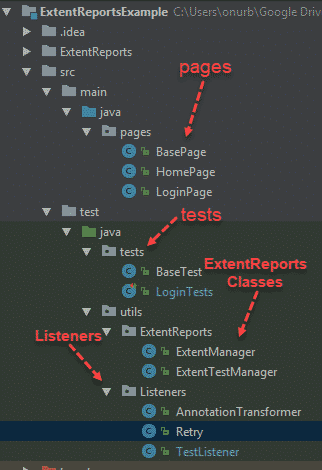 How can we add Classname.testmethod name in extent report ? in test pane. By the way wishing you happy new year and thanks for great article. great article, it helped me a lot. Still, i have a question: Do you know how to perform a linebreak inside the details-column? Tried “\n” but it doesn’t work, as well as multiple blank characters (” “) are not shown in the result of the ExtentManager. Do you have any idea how to fix it or maybe create more columns? Hi Thomas, I am not sure but maybe extentreport code truncate that line breaks and spaces. I need to play around that but I really can not find time nowadays. I have one question as it seems that the relevant code for extent report has been moved to aventstack. So i tried updating the code but it gives me error in all classes. Can you help me with that? Hi Rahul, I will check this and update the article when I will have free time. Nowadays I am super busy at work. Please update latest versions in that article in your pom.xml. Hi Onur, great article BTW. I have a query; I am running multiple classes via TestNG.xml in parallel, all my Test Classes extends BaseTest; will the tests use the correct driver instance that that particular test??? Thanks please check below articles. If I have time, I will update the article codes with the latest dependencies and changes.